2nd Anniversary Party & You're Invited! by Mari Robeson in Entertaining Magic!, New News! It's really been amazing how fast two years have gone by since opening the boutique. I am so blessed to have met some incredible people throughout this journey. I am deeply grateful for all the support I have received and for all the wonderful friendships I have made. This is my opportunity to thank *you*, so I'm throwing a party! 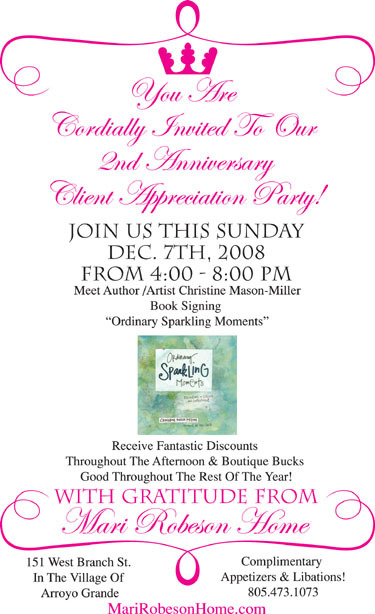 My incredibly creative and talented friend, Christine Mason-Miller, will be at the party signing her beautiful, new book, "Ordinary Sparkling Moments". Christine is one of those people who changed my life. Her constant support and guidance is a gift I will always cherish. All the merchants will also be open as it is our Christmas In The Village. It's a great time to come down and get a jump start on some shopping while enjoying many festivities. I will have special offers that afternoon and lots of surprise treats. Most of all, I want to say Thank You, for embracing this little vision of mine. Also, the new Live Artfully Magazine is out. (FYI...A subscription is a fantastic gift idea!!!) I have a fun article in it and there are tons of recipes. This is Jenny's Cook Book Issue and it doesn't disappoint! My new fabrics are here too...just so much to check out....so come on bye! This Sunday, December 7th, 4:00 - 8:00pm! Happy Holidays!! !